In April 2014, metro stops in Amsterdam and Rotterdam were transformed into art galleries. Passengers were treated to animated paintings from the Dutch Rijksmuseum being played between the train tracks. This digital exihibition was iniatiated by the museum’s main sponsor to celebrate one year since the reopening of the museum in 2013 with paintings being projected in 16 metro stations across a total 85 screens. By photographing themselves in front of the screen, passengers could even become part of the picture and then share the result on social media. The initiative is set to return in 2015 with six pictures from the late Rembrandt exhibition. The animations can be seen on the website of the Rijksmuseum’s sponsor. However, digitally-animated paintings are no substitute for a visit to the exhibition in person. They should be seen more as advertising, aimed at getting high-tech aficionados interested in art. There are other approaches being taken besides this marketing-conscious arena, though, such as bringing art within reach of those who cannot appreciate it with their eyes. A prime example is the Unseen Art Project created by the Jolla cofounder, Marc Dillon. 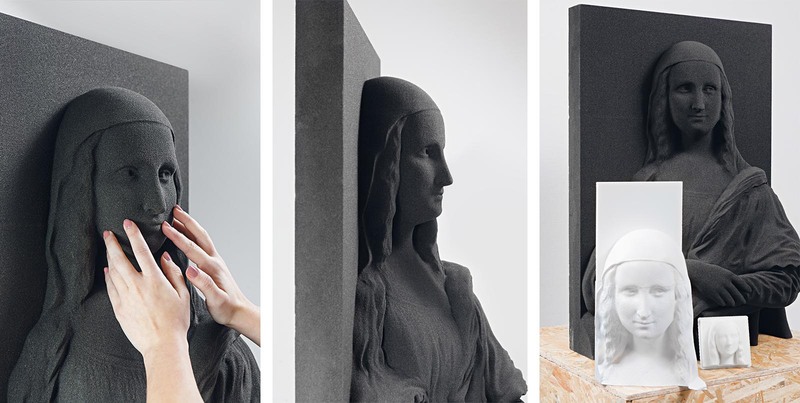 Presented in 2015 on the Indiegogo crowdfunding platform, this project is aimed at giving blind and sight-impaired people the opportunity to feel famous artworks through 3D recreations. These 3D models are made available for download free-of-charge and can be brought to life using a 3D printer. The initiative has now ended since only 14% of the envisaged funding of 30,000 US Dollars could be raised. There is a similar project entitled Touching the Prado. The Museo del Prado in Madrid has been inviting blind and sight-impaired people to touch relief prints of selected artworks from the exhibition and experience art through the sense of touch. The exhibition also incorporates audio recordings and braille information boards. The process of converting the pictures into 3D form involved some artistic interpretation, as well as an analysis of the pictures’ textures, shapes, surfaces and colours. The system used (Dido) has since been used in other exhibitions, too. In addition to the use of moving pictures for advertising and sight-impaired people, animated paintings can help to interpret pictures, enhance their mood, and can provide details on context and even tell stories. Julie Taymor’s Frida (see Frida under the Painting Movies section) is a prime example of how cinematic narrative and animated artworks can be woven together. The real-life shots are blended so artfully with the animated paintings that an entirely new narrative perspective is created. The Moving Paintings section features four artworks by Vincent van Gogh, Edward Hopper, Frida Kahlo and Francisco de Goya presented as animated paintings. The animations are exemplary work and highlight a range of applications and potential. Aopen: KPN brings paintings of the famous Rijksmuseum Amsterdam to life via digital signage. 2014.